Saturday July 1st (2017) is the Southern California Corgi Nation's Official BEACH DAY! 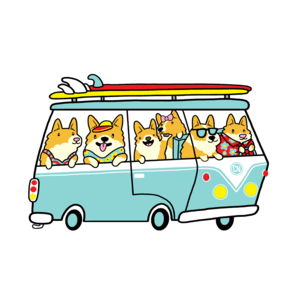 Corgi lovers from all over So Cal will be heading to Long Beach for a day of fun and frolic! (10 am to 3 pm) There are games, picture opportunities, things to do and buy, treats and hundreds of Corgis and their families! The festivities stretch from Rosie's Dog Beach all the way to Alimitos Beach. Fear not!This year there is plenty of parking at 700 E. Shoreline Drive! (Tons of it, they promise!) Go! Take the kids. Have fun! Cool Off!